Roasted butternut squash is a healthy recipe that’s perfect for an easy Thanksgiving side dish. This savory vegetable is roasted in the oven with butter and seasonings. Since it’s in season in the fall, learn how to make the best of this tasty squash by cutting it in cubes, slices or halves and roasting it. Are you wanting to try butternut squash but are a bit hesitant? Don’t let this popular fall vegetable intimidate you. Roasted butternut squash is sweet and nutty in flavor, and is surprisingly versatile. It can be cubed, cut in half, sliced, hasselbacked, and puréed. Use it as a side dish, in soups, salads, hummus, risotto, or quick breads. Butternut squash puree is also a great substitute for pumpkin puree! What are the benefits of butternut squash? High in potassium, which helps lower blood pressure. High in vitamin A, which helps improve eyesight. High in fiber, which helps maintain your digestive tract. Yes, one cup has 16 g of carbs. It’s similar to other starchy veggies like acorn squash and pumpkin. Compared to sweet potatoes, it’s lower in carbs. What other ingredients would give me a savory, bold flavor? Start by washing and patting dry the outside of the squash. Cut the ends off with a sharp chef’s knife. If you find this too hard, pierce the squash all over with a knife to let the steam escape, then microwave for 2 to 5 minutes to soften it. Let it cool. Slice the squash in half lengthwise, starting at the bottom. Use a metal spoon to scope out the seeds and pulp. Use a grapefruit spoon to scrap out any pulpy strings. Place on a foil lined baking tray, and brush generously with butter. Sprinkle with salt, pepper, and lots of fresh thyme. Roast at 425 F for 1 hour 10 minutes (for a 4-pound squash) or until the flesh and skin are tender when pricked with a fork. Rotate half way through. Let cool slightly, then slice the neck into 14 slices. Use a mini cookie cutter to cut out acorn shapes. Arrange on a serving plate, drizzle with melted butter, and sprinkle more salt, pepper, and fresh thyme on top. Any leftover squash from the neck or bulb can be cubed up to use in a salad. Serve warm and enjoy this healthy vegetable with your family and friends. Make the squash easier to cut by piercing it with a knife all over, then microwaving it for 2 to 5 minutes. Let cool. Peel the squash with a sharp chef’s knife or a Y-shaped vegetable peeler. Butternut squash doesn’t discolor quickly when cut like apples. If you roast it long enough, the peel softens so you can eat it. For a hasselback squash, cook it for 30 minutes. Let it cool, then cut in the hasselback pattern. Baste with butter and cook for another 30 minutes. Puree the squash by removing the flesh from skin and pulsing it in a blender with spices and a bit of water or milk. Freeze pureed squash in muffin tins or ice cube trays for one hour, than put in a freezer bag. Want to eat the seeds? Boil 10 minutes in salted water, drain, pat dry, toss with oil and seasonings, and roast on a tray. What’s stopping you from roasting a butternut squash for dinner tonight? This squash not only is very healthy, it tastes amazing, and will make your house smell incredible. Go ahead and try it, you’ll be glad you did. Surprise your family and friends with the simple deliciousness of these other roasted veggie dishes. Butternut Squash Soup: a delicious clean eating soup that’s great for Thanksgiving. Roasted Sweet Potatoes with Cranberries: garlic, rosemary, and maple syrup flavor this savory side dish. 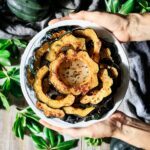 How to Cook Acorn Squash: garlic butter coats these aromatic and healthy squash slices. Did you roast butternut squash with this recipe? Please leave a recipe rating below to share how you liked it. Rinse and pat dry the butternut squash, then cut off its top and bottom. Cut in half lengthwise with a large sharp knife. Remove the seeds with a metal spoon, then remove the stringy flesh with a grapefruit spoon. Set aside the seeds for roasting later. Place the butternut squash flesh side up on a large, foil-lined cookie sheet. Brush the flesh with butter, then sprinkle the spices on top. Roast the butternut squash in the oven for 30 minutes, then rotate the pan and roast for another 30 minutes. The squash should be fork tender. If the squash is larger than 4 pounds, it will require more time. Place the butternut squash on a large cutting board and allow to cool for 5 minutes. Cut the straight neck part off and slice it. The rounded bulb part can be cubed up. If you choose, puree or mash the entire squash without the skin. Arrange the slices of squash on a plate. Cut out some acorns, leaves, or other fall shapes with small cookie cutters and place them decoratively on the plate. Drizzle the squash with melted butter and sprinkle with additional fresh thyme, salt, and pepper. Serve warm.